Jeff Zalles runs the ultimate unique laundry business; a laundromat that showcases live gigs and serves nachos. Imagine if when you took your washing to a laundromat you could watch an open mic night or comedy show while you're waiting, and enjoy Santa Fe Chicken washed down with a beer. Since 1989, BrainWash has provided a venue for up-and-coming acts to gain exposure. This San Francisco-based laundromat provides coin-operated washing machines, as well as a cafe, bar and music venue. "When I bought the laundromat it was already set up in the leisure industry," says current owner Jeff Zalles. The 60-year-old entrepreneur, who takes his life "day by day", financed the acquisition through home refinancing. "I don't tend to follow a fixed plan," he says, "and I haven't expanded the company yet!" But Zalles seems to be doing something right. With the whole of March fully booked for gigs and live performances, BrainWash is proving to be a popular spot. Asked if he enjoys running the business, Zalles answers: "Yes, it really is lots of fun! There are no disadvantages to running this business." The opening hours are from 7am till 10pm Monday to Thursday, closing at 11pm Friday and Saturday, and trading from 8am to 10pm on a Sunday. But even with these demanding business hours Zalles still finds no reason to complain. "Along with my team of 20 employees, I have no difficulty in supervising the food service, maintaining the laundromat or organising the events calendar," he insists. Unsurprisingly, conducting PR and getting press coverage for a laundromat that doubles as a gig venue was like shooting fish in a barrel. "The business received a lot of PR for its uniqueness, which meant the business took off from day one." Mindful of the marketing opportunities presented by the unconventional dual service, the business also sells its own merchandise including laundry bags, t-shirts and baseball hats. "All our merchandise is designed by a professional firm, and the logo and branding is consistent throughout the company," Zalles explains. The first washaterias were dominated by Chinese immigrants, with New York City alone featuring over 3,000 Chinese-owned laundries that employed one out of every four New Yorkers of Chinese origin. In 1933, the New York City Council, noticing the laundry business was becoming profitable, passed a law to drive Chinese owners out of the industry, by restricting ownership of laundries to US citizens. In response the Chinese Hand Laundry Alliance (CHLA) was formed, which successfully challenged this law and Chinese hegemony over the sector was preserved. Zalles insists that it's not difficult to thrive in the laundromat industry but that sectoral experience - whether your own or if you hire someone with a background in the sector - is important. "It has been relatively easy to get ahead in the laundromat industry, and I don't consider it a competitive trade at all," he says. "However, if you're just starting out in the business for the first time, then do your homework. If you have no experience, then find someone who does to help you." BrainWash offers a variety of hot and cold food, from 'Wash Load Nachos' to 'Salmon Burgers' and a range of breakfast combinations. Among the praise heaped on the restaurant is this comment on a review site: "What a great idea, combining a laundromat with a-cafe restaurant". BrainWash has four weekly events: Free Feature Salon, The Ladies Room, Acoustic Open Mic and Comedy Night. Friday to Sunday the stage tends to feature three different acts. BrainWash offers an alternative take on the traditional laundromat business, establishing a niche perhaps few others in the world have emulated. With people's lives becoming increasingly busy, the concept of combining your time-consuming household chores in a social environment has a bizarre but understandable appeal. 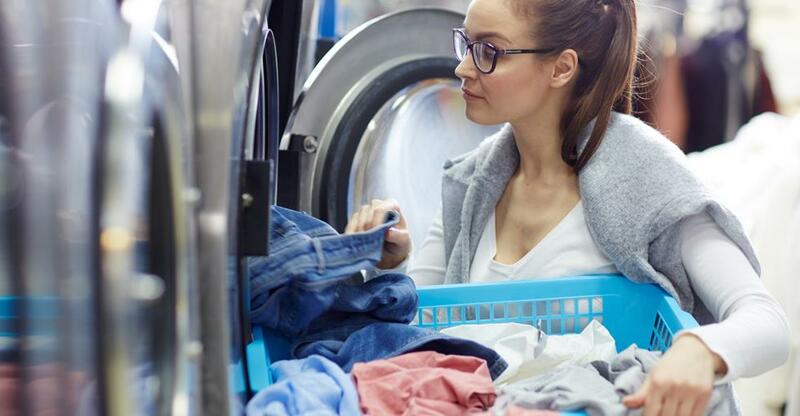 With approximately 35,000 coin-operated laundromats in the US, generating $5bn in annual gross revenue, independent laundromats can prove profitable, especially if you have qualities that set your business apart from chain laundromats.